A chance audition at UNC set Victoria Livengood�s opera career in motion. She has traveled from Thomasville to Chapel Hill to Boston and New York to Spain and Taiwan. For her work in opera, Livengood earned a place in the North Carolina Music Hall of Fame in 1999 alongside Loonis McGlohan and Nina Simone. This month Livengood will perform in Opera Carolina's "Eugene Onegin" in the role of Filipevna, a nurse, in the Tchaikovsky drama. Born in Thomasville, Livengood, 52, has had a career that for decades found her traversing the globe, finally returning to her North Carolina roots and settling down in Mint Hill in 2009 for life's next chapter. "I grew up on a farm in Thomasville and have never been far from lessons learned there," Livengood said. Faith, family and sharing the power and joy of music are the values she said she holds most dear. Livengood grew up in a musical family where her father sang bass in a championship-winning barbershop quartet and her mother was an alto lead singer for a Sweet Adelines group. "There was always singing in the house, in the car, at church and revivals," Livengood said. "I inherited an operatic voice blend of darkness and light from my parents. Loud and low, my voice is a mix of Ethel Merman and George Beverly Shea." 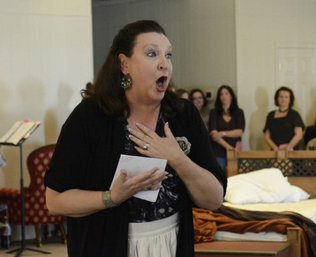 While Livengood did plenty of singing as a girl, she never sang professionally and never experienced live opera before leaving Thomasville for college at UNC Chapel Hill. "I had every intention of becoming an attorney," she said. "I loved to talk, never lost an argument and loved to dress up." As it turns out, a single credit hour on her introductory schedule as an undergraduate ultimately led to her career in opera. "I was 18 years old, had never been away from home and was one credit shy of a full course load," Livengood said. "The adviser asked me what I might be interested in, and I told him I liked to sing. The next thing I knew I was auditioning for the Carolina choir director, Robert Porco, who now is director of choruses at the Cleveland Symphony. After I sang 'The Hills are Alive' from 'The Sound of Music,' he whisked me over to sing for the voice faculty and I was offered a music scholarship on the spot." Even more memorable for Livengood was how nervous she felt during the call home to her father telling him she was abandoning pre-law to become a singer. It was an auspicious start to an accelerated ride to the top performing tiers in opera. "Once I began voice training and learned how to sing it was if I were hit by a lightning bolt," Livengood said. It was then that she fully realized the gift she'd been given. Her first exposure to live opera was attending "La Boheme" at Ovens Auditorium in the late '70s. Nearing the end of her program, Livengood was encouraged to audition for the Metropolitan Opera in a regional competition, though she was warned by her teacher she didn't have a chance of winning. Not only did she win, she went on to win the Met's National Council Auditions, earning funding for additional training and an agent who marketed her for roles. It all paid off as she took the stage in her Metropolitan Opera debut in 1991 as Laura in "Luisa Miller" conducted by James Levine. It is in Bizet's "Carmen" where Livengood truly established herself. "The role fits me like pudding in a velvet glove," Livengood said. She estimates she has performed the French opera more than 250 times worldwide. When Livengood performed the role in Opera Carolina's 2003 production, Observer critic Steven Brown wrote, "Livengood's Carmen was a vocal fireball... In Acts 1 and 2, where Carmen's charisma is on display, Livengood laid on more hip-swinging and hair-tossing than a silent-movie vamp." Livengood's performance list reads like a world travelogue with many of the finest opera companies in the world, including the New York City Opera, Lyric Opera of Chicago, L'Opera de Nice, Teatro Real in Madrid, Italy's Spoleto Festival, the Santa Fe Opera, Taipei National Symphony Orchestra and many more. Is she disappointed as a mezzo-soprano that she hasn't had the opportunity for some of the more desirable soprano roles? "Not at all," said Livengood. She relishes the saucier roles traditionally reserved for mezzos. "As I have aged, my voice seems to have deepened a bit toward the range of contralto, allowing me to pursue an entirely new category of roles," Livengood said. She is traveling less now than in years past. Her touring schedule is seven months on the road during the year, down from nine. "I moved back to North Carolina after many years in Florida to be closer to family," Livengood said. "I have several local students and others who travel to work with me. It is one of my greatest joys to be able to work with young people, helping develop their talent." James Meena, Opera Carolina's general director and principal conductor, is thrilled to once again work with Livengood. Livengood performed in "Carmen" in 2003 with Opera Carolina. "When Vickie returned to North Carolina and made Charlotte her home, we immediately began looking for an opportunity to showcase her talent," Meena said. "She is a dynamic person, which carries over to her commanding stage presence and simply wonderful voice. She also shines in her qualities as an actress in bringing great character and interest to her roles. Vickie is a huge talent and now that she is in our community, we expect to see her on our stage often." Meena noted that mezzos, given the right care of their voice and technique, can have extended careers and sing well into their 60s. "I expect we'll be seeing Vickie Livengood on the stage for many years to come," Meena said. For Livengood and her fans, the notion is music to their ears.